The importance of safety glasses cannot be stressed enough. Though looking mundane, this little device plays a crucial role in improving the work environment and keeping your eyes safe. They are made out of a sturdy and clear material such as polycarbonate that prevents flying particles from entering your eyes. They feature frames that comfortably fit on your head and may include rubber-tipped temples or soft rubber noses for better comfort. Modern types also come in special coating to protect your eyes from glare, bright light and ultraviolet (UV) rays. After scrutinizing the market, we now present the 10 best safety glasses in 2019. 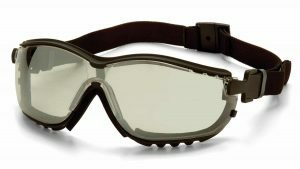 Protect your eyes from dust, dirt, wind and flying particles with this pair of safety glasses by Encon. The untainted clear lenses are made from polycarbonate and supported by a translucent blue frame that easily wraps around the head. Suitable for both indoors and outdoor use, the quality glasses are resistant to scratches and impact and protect the eyes from 99.9% UV rays. 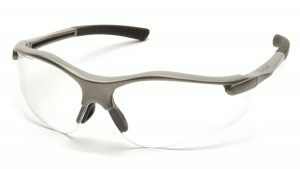 The semi-rimless curved lens design is very elegant while the adjustable nose piece is soft and comfortable. Although they offer good protection against UVA & UVB, are lightweight, and don’t fog easily, this safety glasses aren’t very tight and cleaning them is also not very easy. Enjoy good visibility while safeguarding your eyes from dust, wind, glare and other elements by adorning the Fortress safety glasses by Pyramex Safety. Made from top grade polycarbonate, this eye protector is suitable for variety of activities and can be used both indoors and outdoors. The lens is not only scratch resistant but also shields up to 99.9% of UV rays while the vents allow good air circulation that minimizes too much heat or fogging. Like-able points include good protection, versatile design & fit, adjustable nose pad and good comfort. Drawbacks are that although they are scratch-resistant they are not scratch-proof. Keeping your eyes safe from too much wind, dust, impact, harmful UV rays is more guaranteed with the rugged Blue SC-260 safety glasses. They are built using scratch and impact resistant polycarbonate UV400 which also combats UVA & UVB rays. The eye piece easily-fits around the head with the wide soft temples minimizing strain on the sides. People love this product because it’s easy to wear, remains in place even in demanding environments and can filter out up to 99.9% of UV. However, the safety glasses won’t fit over prescription glasses and may be a bit loose on people with narrow heads/faces. 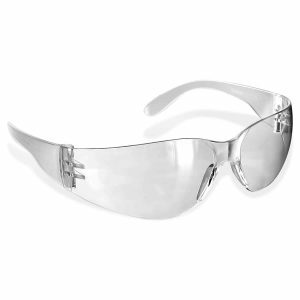 This safety eye-wear is made out of clear scratch-resistant polycarbonate and provides good visibility while stopping nay harmful particles such as dirt, dust, wind from entering the eyes. The lens also safeguards the eyes from too much glare, light and ultraviolet rays. Other that supporting the lens, the frame also adds style to the glasses while the soft foam minimizes any discomfort. Resistance to impact, scratches, and good protection against UV, glare and comfort are its main pros. The main disadvantages are lack of protection around the nose area and feeling a bit tight when new. 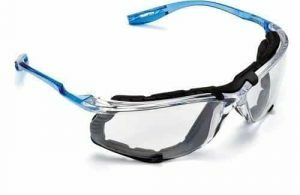 The V2G safety glasses by Pyramex Safety are made from specially-treated polycarbonate that prevents dirt, dust, wind and other particles from entering the eyes. They come with small vents that allow good airflow and also help in minimizing fog buildup. The lenses are resistant to impact, scratches and will stop up to 99% UV rays. Together with the Real Tree Camo Frame, the eye protector easily adjusts to different head types and sizes. 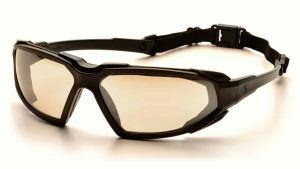 However, the safety glasses are a bit rigid and therefore not very suitable for demanding environments or rough handling. This eyewear by 3 M consists of a lightweight frame weighing less than one ounce and polycarbonate lens. The clear frame together with lens offer good protection to the eyes while ensuring you are still comfortable. The anti-fog lens filters up to 99.9% of UV whereas the adjustable frame allows you to find the best position. Merits that make the 3M Virtua among the 10 best safety glasses in 2019 include; lightweight, stylish, good protection and adjustable frames while its demerits are no nose piece and no case. 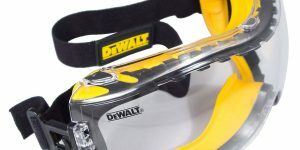 Keep your eyes safe from harmful objects such as too much light dirt, dust, ultraviolet by wearing these safety glasses by Dewalt. Made from clear polycarbonate, the impact and scratch-resistant eyepiece will ensure nothing gets into your eyes while stopping any fogginess/mist inside the glasses. It comes with adjustable telescoping temple and a dual-injected cushioned rubber brow for added comfort. Although very comfortable, ergonomic, easy to clean and durable, this eyepiece isn’t very effective against smoke or fumes. 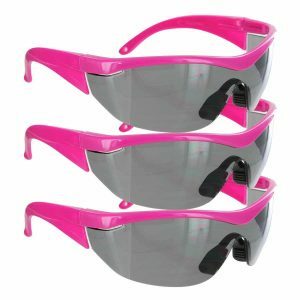 The Navigator safety glasses by safety girl consist of clear and long-lasting polycarbonate lens and colorful and flexible frames. It is tolerant to abrasions and scratches and will maintain its appeal for a long time. However, its not 100% scratch-proof meaning it will still get damaged when handled poorly. The UV400 safety glasses are ANSI Z87.1 & CE EN166 certified and will stop harmful UV rays. Unfortunately, they are most suited for women especially those with narrow heads/faces. This light and clear eyewear by 3M is made from anti-scratch, anti-glare and anti-fog polycarbonate that absorbs up to 99.9% UV. It comes with Cord Control System (CCS) that ensures the built-in earplug is ready for use and never gets entangled. 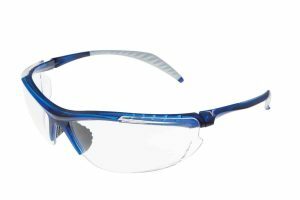 For extra comfort and convenience, the ANSI Z87.1-2010 approved eyewear also features optional foam gasket attachment. Besides being resistant to scratch, fog and glare, this easy-to-wear piece is also impact-resistant. However, it’s not very sturdy and can easily get damaged when handled roughly. 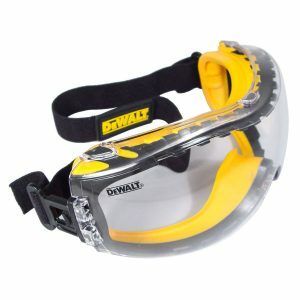 Top on our list is the Dewalt DPG82-11 Concealer safety glass. Made from strong polycarbonate and coated with a hard substance, these goggles will protect your eyes from dust, dirt, 99.9% UVA/UVB, smoke, and glare for a long time. The hard-coated lens is resistant to impact, scratches, fog, fading and will maintain its clarity. It features an elastic headband that properly secures it on the head while soft dual injected rubber against dust, smoke and debris. Some people have stated that the nose piece tends to ride up when worn together with a respirator. You shouldn’t expose your eyes to dust, dirt, smoke, heat or flying particles or debris when working. You don’t need to strain your eyes because of too much light, glare or UV rays. Furthermore, you shouldn’t feel uncomfortable or hard-pressed by tight safety glass frames. 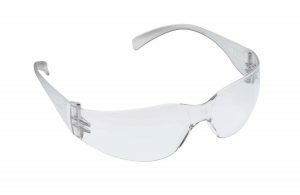 With the above safety glasses the issues mentioned above will be nonexistent thus ensuring you work in the best environment. They are light, comfortable, stylish, affordable, and versatile and have passed safety tests. Backed by positive reviews, top star rating and many reviews, you can be certain that the 10 best safety glasses will serve you right and for along time to come.